Medvedgrad (pronounced [mědʋedɡraːd]; Croatian for bear-fort; Hungarian: Medvevár) is a medieval fortified town located on the south slopes of Medvednica mountain, approximately halfway from the Croatian capital Zagreb to the mountain top Sljeme. For defensive purposes it was built on a hill, Mali Plazur, that is a spur of the main ridge of the mountain that overlooks the city. On a clear day the castle can be seen from far away, especially the high main tower. Below the main tower of the castle is Oltar Domovine (Altar of the homeland) which is dedicated to Croatian soldiers killed in the Croatian War of Independence. In 1242, Mongols invaded Zagreb. The city was destroyed and burned to the ground. This prompted the building of Medvedgrad. Encouraged by Pope Innocent IV, Philip Türje, bishop of Zagreb, built the fortress between 1249 and 1254. It was later owned by bans of Slavonia. Notable Croatian and Hungarian poet and Ban of Slavonia Janus Pannonius (1472), and Ban of Croatia Ivan Karlović (1531), died in the Medvedgrad castle. The last Medvedgrad owners and inhabitants was the Gregorijanec family, who gained possession of Medvedgrad in 1562. 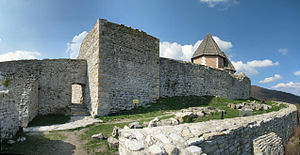 In 1574, the walls of Medvedgrad were reinforced, but after the 1590 Neulengbach earthquake, the fortress was heavily damaged and ultimately abandoned. It remained in ruins until the late 20th century, when it was partly restored and now offers a panoramic view of the city from an altitude of over 500 meters (1,600 ft). ^ Mašić, Boris. "7. Medvedgrad". Zagreb City Museum. Retrieved 14 August 2015. ^ Radauš, Tatjana (2002). "Gregorijanec". Croatian Biographical Lexicon. Miroslav Krleža Institute of Lexicography. Retrieved 14 August 2015. Wikimedia Commons has media related to Medvedgrad. This page was last edited on 19 March 2019, at 18:21 (UTC).